The community of Paw Paw is what one might call “an old soul,”with a checkered past, a tradition of personal industry, and a good sense of humor to carry it over the bumps in the road. The first settlement in Paw Paw Township was made within the limits of the present village in 1832, when Rodney Hinkley located on a piece of land within the northern part of the town. In that same year, Pierce Barber of Prairie Ronde began the erection of a saw mill on the river in what is now the western part of the village. This property was later purchased by Peter Gremps and Lyman I. Daniels, who had come to Paw Paw on a prospecting tour in 1833. Gremps and Daniels bought the mill and a considerable tract of adjoining land, which they surveyed and platted as the village of Paw Paw in the spring of 1838. This plat was located on the east side of the Paw Paw River, just below where the east and west branches came together. It was, the old notes say, quite an ambitious village in its inception, containing 51 blocks. Gremps returned to the east with plans to bring his family to settle here. While he was absent, his partner, Mr. Daniels, was busy looking after the mill and, as old stories go, devising means to further the interests of the new village. He thought there ought to be a tavern; so, one day in 1834 in Schoolcraft, he met Daniel O. Dodge, a school teacher, and offered to give him an entire block in Paw Paw and build a board house for him, if Dodge would come and keep a tavern in it. Dodge agreed, and in the same year, opened an inn, which became one of the most noted public houses in southwest Michigan. Dodge’s Tavern stood on the south side of Main Street (now Michigan Avenue) and was nearly hidden by trees. Trees were so abundant in Paw Paw at the time that travelers often passed through the village without knowing there was a town there. Gremps brought his family to Paw Paw in 1835, and never lived outside of the village after that. He built the first store and served as the first post-master here. He enticed Dr. Enos L. the community’s first physician. Following Gremps’ lead, other merchants took up shop in Paw Paw. They were carpenters, shoemakers, coopers, millers, cabinet makers, blacksmiths, tanners, carriage makers, ministers, clothers, doctors, lawyers, teachers, and more; but most were farmers first. In 1846, Judge Evert B. Dyckman and Reverend Joseph Woodman platted an addition of 16 blocks on the east side of the original plat. Two years later, when the village was re-surveyed, other sections were added, including Isaac Willard’s addition on the west side of the river. Willard had been Gremps’ partner when he opened his store on Main Street in 1838. He was said to be eccentric, but closely identified with the interests of Paw Paw. He was the moving force in the development of Prospect Hill Cemetery, and devoted much of his time, care, and pride to the project. As most budding communities of the time, Paw Paw’s growth hinged on necessity. After four severe fires rav-aged sections of the business center, a fire department was established.The business district fires also promoted the need for a public water system for the village. 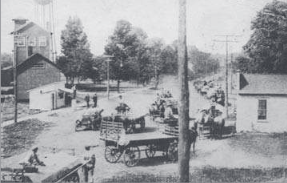 The village is-sued bonds in 1898, and after a favor-able vote of the trustees, constructed a water system at a cost of $18,000. The village purchased a site from the Paw Paw Mineral Water Company, which had been bottling and selling water from the mineral springs here. The first water pumps were steam powered, the source was open wells. Later, the plant was electrified and several wells were driven as the need grew. The village council had arranged for a municipal electrical system about 10 years earlier, when trustees granted a franchise to Dr. T.R. Harrison of Paw Paw for electric lighting in November of 1890. Harrison’s plant was set on the east branch of the Paw Paw River at Lanphere’s Pond and Dam. After the first six months of operation, it was determined there was not a sufficient water supply to run the turbine for 24-hour service, and use of the plant was discontinued.In 1893, the village built another plant, at the west end of the Michigan Avenue bridge, using water from the south branch of the river; but by 1906, this, too, was overloaded and village residents voted for a $50,000 bond is-sue to finance a new plant.This time, the Paw Paw River was dammed, creat-ing Maple Lake,and the new plant began operations in the fall of 1907. The hydro-electric plant served the village until a raging snow storm during the night, December 8, 1937, caused the waters of Maple Lake to rise so the plant and the bridge connecting Maple and Ackley lakes were all washed away. The plant was rebuilt on the same location two years later, but by the 1950’s, power had been furnished by Michigan Gas and Electric Company on a contract basis for several years.